The words and diagrams on this page are all mine, except where otherwise noted. Please don’t blame Parelli if I didn’t get something right. Parelli Natural Horsemanship™ is a trademark of PARELLI NATURAL HORSEMANSHIP, INC. which does not sponsor, authorize or endorse this site. The tip of the tip of the tip of the iceberg, kind of a quick start guide to Parelli vocabulary, shorthand, and concepts. I include this page so that the blog makes more sense to those of you who don’t have horses or who don’t study Parelli. The ultimate way to train a horse is to train its human. The Parelli Program is a people-training program about horses. While the program content focuses on the study of horse behavior and horsemanship skills, the program itself is designed to serve the multiple ways that adults learn: visual, aural, textual, and so on. The four areas of study are called the Savvys. Combined, the Savvys cover everything we and our horses must learn to become true partners. The Parelli Patterns are exercises that develop the mental, emotional and physical fitness of you and your horse. There are patterns for all four levels in each of the four savvys. The Seven Games are the language of horses and as you progress through the Levels you become more and more fluent. Horsenality is a method of identifying the key behavioral tendencies and preferences for an individual horse so that you can adapt your training methods to be most effective for that horse. The Horsenality framework provides guidelines for how to communicate with an individual in ways the individual is likely to appreciate, similar to what the Myers-Briggs Temperament Sorter, the Kolbe Index, and the DiSC Report do for humans. The Parelli Horsenality framework also creates common vocabulary for Parelli students and professionals to use when describing the challenges, achievements, questions, and needs of the horse or student. Don’t make or teach assumptions. Communication is two or more individuals sharing and understanding an idea. Horses and humans have mutual responsibilities. The attitude of justice is effective. Body language is the universal language. Horses teach humans and humans teach horses. Principles, purpose and time are the tools of teaching. Act like a partner, not like a prey animal. Act like a partner, not like a predator. Use the natural power of focus. We humans learn more from these games than our horses do, I think; the horses already know the games and just need to learn how each individual human plays them. The descriptions below are only to give you an idea of each game’s purpose and power. Even the highest level of performance, horsemanship, and success with horses is “just” a combination of the following 7 games. Friendly Game. Builds trust and confidence between horse and human. Porcupine Game. Teaches horse to move away from steady pressure. Teaches human to be consistent, fair, and able to read the horse and adjust steady pressure accordingly. Driving Game. Teaches horse to move away from rhythmic pressure. Teaches human to be consistent, fair, and able to read the horse and adjust rhythmic pressure accordingly. Also teaches human the difference between rhythmic pressure and rhythmic motion (and non-rhythmic commotion!). Yo-Yo Game. Teaches horse to go in a straight line, with backward as good as forward. Teaches human to be particular without being critical. Circling Game. Teaches horse to maintain gait and direction with relaxation, rhythm, and contact. Teaches human to be patient and to have feel. Sideways Game. Teaches horse to move sideways as good as he moves forward and back, in both directions, and both away and toward human. Teaches human to adjust to the horse and use all the games and strategies to teach something complicated. Squeeze Game. Builds confidence, respect, and curiosity in both horse and human. Zones help us refine our communication and troubleshoot what’s happening when we’re asking for A but getting B. (Illustration found randomly on web. If it’s yours, let me know!) . 4 Savvys The Parelli term for the categories of ways we play with our horses, each with its own set of achievements and challenges. Everything we do with horses fits into one of these, and the Parelli program emphasizes the importance of progressing from one to the next and attaining the right balance of all four. On-Line. Horse and human communicate on the ground with the help of a rope, typically 12 ft, 22 ft, or 45 ft long. Liberty. Horse and human communicate on the ground without a rope. Freestyle. Human rides horse on a loose rein, only making contact (with leg, rein, etc.) when guidance is necessary. 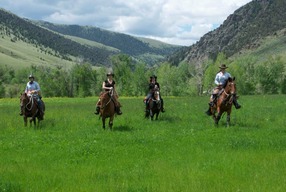 Example: trail riding. Finesse. Human rides horse with contact, for precision and high-level atheticism. Example: dressage or reining. The Parelli program uses the Horsenality™ model to help students categorize certain behaviors so we can respond appropriately. It’s not meant to label the horse forever as one horsenality type. It’s a key that we learners can use to figure out how we can best communicate with the horse in that moment – “the horse that shows up” – no matter what that horse was like yesterday, last week, an hour ago, or what he’ll be like in the future. 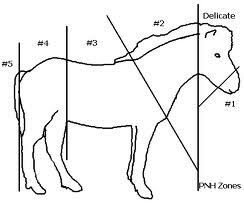 You can download the horsenality chart (PDF) although it won’t make much sense without the educational materials. Left brain generally means the horse is thinking, not scared, maybe dominant or challenging. Right brain generally means prey animal instincts kick in with fear, inability to think, unable to tune in to human. Each state of mind requires the human to use different strategies to center the horse so he can become a willing, trusting, exuberant, curious, confident, and playful partner. Here’s a little slogan for each horsenality, to give you a sense of what I need to be ready to engage at any moment, and what I mean when I use these abbreviations in the blog posts. Parelli is all about education. Pat says he’s finally found a way to “do this for free,” and has created a 501(3)c non-profit organization to do so. PEI has some great contests and promotions going most of the time. The Parelli Education Institute is an independent, non-profit organization for the natural horsemanship community that focuses on education. Our purpose is to support an advanced natural horsemanship education for students with the skills and aptitude to become extraordinary horsemen, educators, or both. We offer educational programs and opportunities to individuals who wish to create careers around horses. Further, we offer educational assistance to those focused on youth horsemanship, therapeutic horsemanship, and equine welfare. Stick to Me A game in which the horse has to keep a zone of his body within a specified distance of a zone of your body, no matter where you go or what you do. You start on-line in zone 1 and practice your way up to all gaits at liberty. Think of it as ballroom dancing, where if you drop the lead, your partner can wander off to the snack table without saying goodbye. And where you stay utterly tuned in to your partner so you can sense their suggestions and guide the dance that way so they have more fun. I made this diagram to help me visualize the priorities for each play session, based on Linda’s article in the May 2009 Savvy Times, “The Ultimate Training Formula.” The diagram uses the placement and a semblance colors of the horsenality chart: 1 – RBE, 2 – RBI, 3 – LBI, 4 – LBE. Each horsenality has a different “first priority” — RBEs need to be calm before they can connect with you, while LBIs need to be connected before they’ll do anything with you Having this diagram in my head helps me do a quick check of our levels in each quadrant before and during our session, so that I can get better about applying pressure and release appropriately, and learn when to be provocative and when to be reassuring. I too enjoy your summary page and description of the program. Great Job! This was very good at explaining what PNH is all about I am going to “PAY IT FORWARD” to help make the world a better place for horses!!! i absouluty love your blog great job!! Great blog– I am wondering if there are any Parelli method classes for novices without a horse. In other words is there a ranch where someone can learn the Parelli method, preferably in the Bay Area, close to SF. Really enjoyed reading in your blog. Thanks.